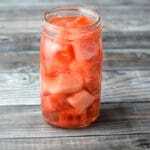 This is my homemade watermelon infused vodka recipe! It is so much cheaper to make at home than to buy in the store! And it’s fun to do! Do you like infused vodka? My favorite infused vodka thus far in my many years of age is not this one. I do like this watermelon infused vodka, but I really love ruby red grapefruit vodka. That’s my favorite. Perhaps I’ll make a ruby red grapefruit vodka infusion recipe next! What say you? I think I’ve spoken about this before (so stop me if you’ve heard it) but in the past I was more of a margarita girl. I still love my margaritas, but my vodka martini has overthrown the tequila yumminess in my mind. When I switched to vodka, I didn’t start off with martinis. Oh no! I started making the grapefruit cosmo with ruby red absolute vodka. For the longest time it was my vodka drink of choice. In fact, I went on a craze with that delicious cocktail. You could count on me to bring the ingredients to parties, get-togethers, and overnight visits to relatives. Everyone loved my grapefruit cosmos. At least in my own mind. My recipe for the watermelon infused vodka is sugar free. Most other fruit infused vodka recipes you’ll find have sugar in them. 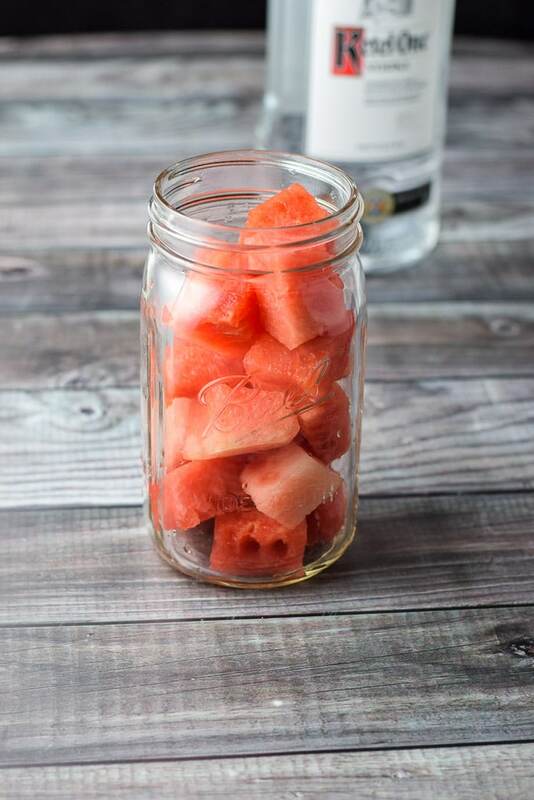 The only sugar in this watermelon infused vodka is the natural sugar found in the watermelon. So, we have watermelon chunks and a good vodka like Ketel One. If you’ve been reading my blog for a while, you will know that I love the vodka brand, Grey Goose! But you don’t need to use your best brand of vodka in this recipe. Your second best will do. 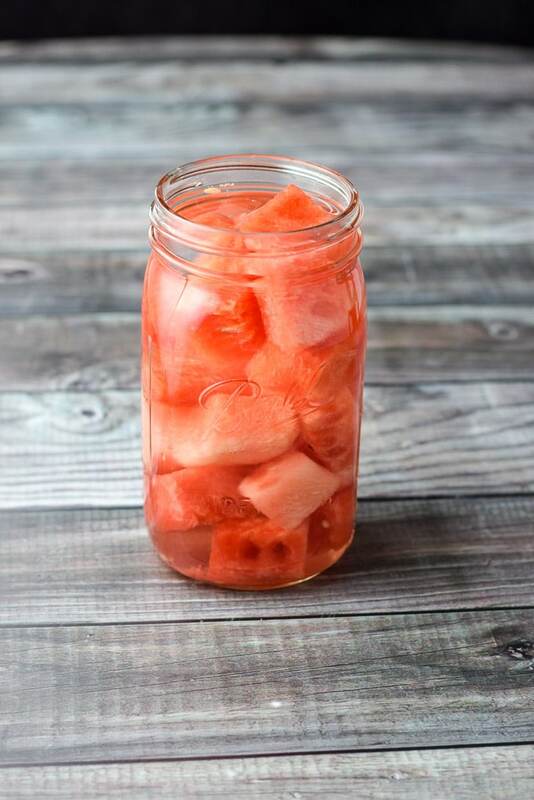 I grab a 28 ounce ball jar and plop the watermelon into it, minus the seeds. Time to pour the vodka into the ball jar to meet up with the watermelon! It took about 2 cups of vodka to cover the fruit. I screw the cap on the ball jar and place it into the refrigerator, where I let it sit for a week. You can taste it after a few days to see if the watermelon infused vodka is done but I find it takes a full week to be perfect! This is what the watermelon infused vodka looks like after a week in the fridge. As you can see, the watermelon shrinks. Here is my warning to you. Do NOT eat the watermelon. If you do, you will find a spongy mess in your mouth and you will say “Glurg” after you spit it out. A “pa-too-ee” might also slip out. Here is the vodka after I take out all the watermelon! Look at how pink it is!! You will have to wait to see what I created with it! But you won’t have to wait long. Please leave me a comment. What is your favorite flavor infused vodka? 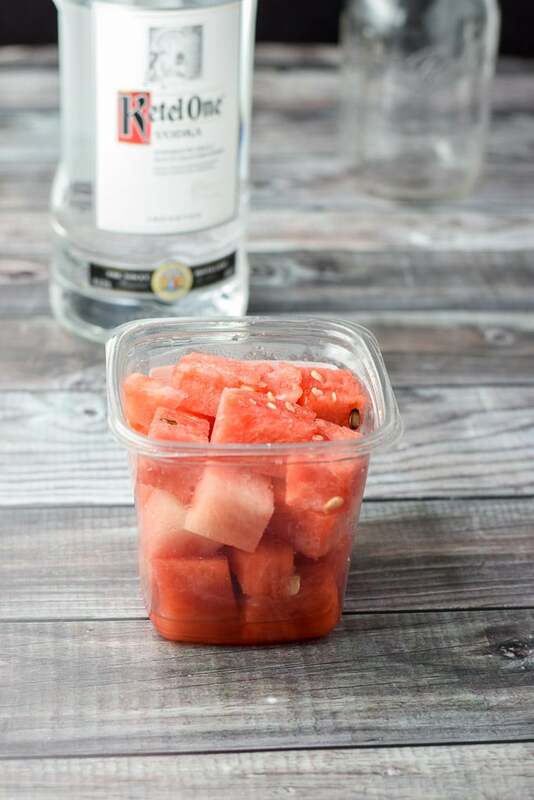 If you’ve tried this watermelon infused vodka or any other recipe on the blog, I’d love the hear what you thought about it in the comments below. I love hearing from you! You can also FOLLOW ME on FACEBOOK, TWITTER, INSTAGRAM and PINTEREST to see more of my delicious food and delightful cocktails! 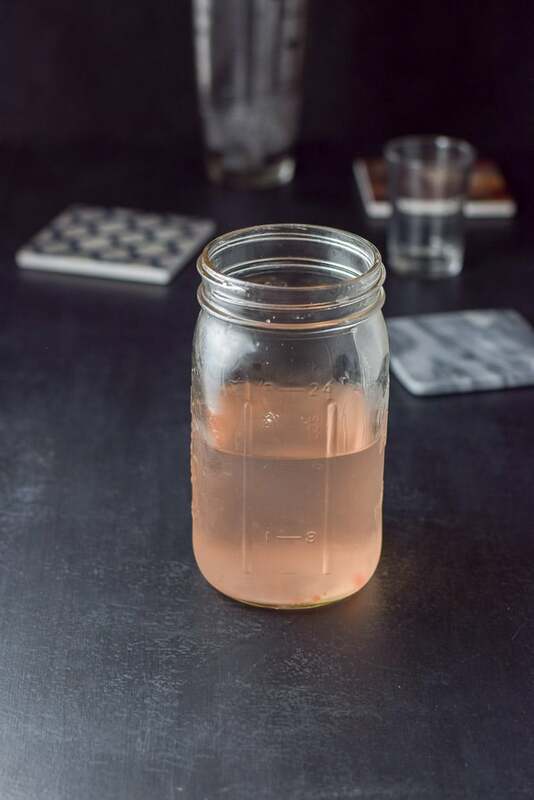 A yummy watermelon infused vodka. Perfect for your next cocktail! I didn't want to put in the time as minutes. This recipe is to rest in the fridge for 7 days. This looks like something I should put together right now so I can enjoy it next weekend! Thanks for the tip on NOT eating the watermelon cause I surely would have dove right in. Aimee! Hehe. You’d be making the glurg face if you did! You’re a clever lady! And a funny one… that warning made me LOL. I too, love vodka so will get some soaking! This looks like a noble use of watermelon! And the post is timely, given summer’s proximity. Cheers, wodka lovers! I’m sure that watermelon could be used for something! But what a great way to add flavor to the vodka! Kelly, thanks. Not sure they could, it was pretty alcohol ridden and spongy! Glurg. I do a similar thing with cherries, sugar and vodka – and you actually do eat the cherries! 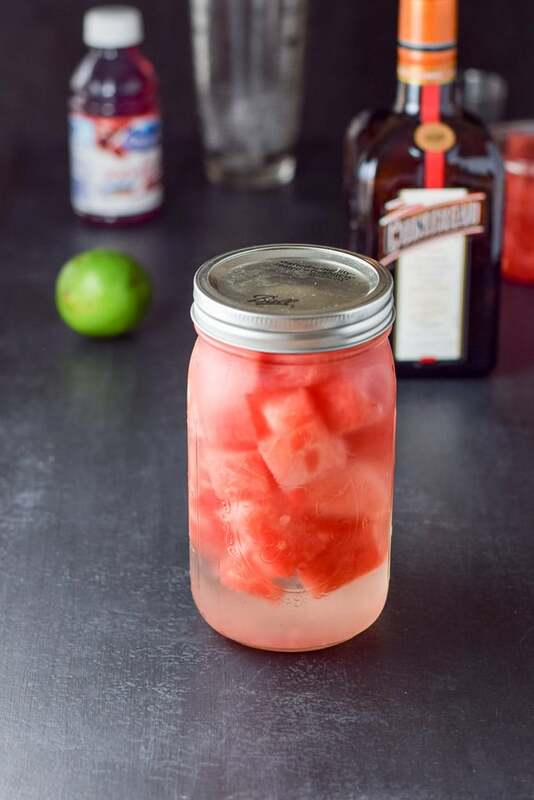 Can’t wait to see what you do with your watermelon vodka! That sounds awesome Lisa! I love cherries, my absolutely favorite fruit! Yesterday I made some bourbon soaked cherries! What a fun summer drink! We do this sooo much in the summers!! Have you tried vodka steeped pineapples?? Just as awesome! Swayam! Now I have to try the pineapples, since I never have! That looks so refreshing and perfect for summer. Plus, it has fruit in it, so it must be healthy right?! Thanks so much Amanda! It would be a great sipping vodka!